The μBenchCAT by Altamira Instruments represents a complete, bench-top reactor for catalytic studies. 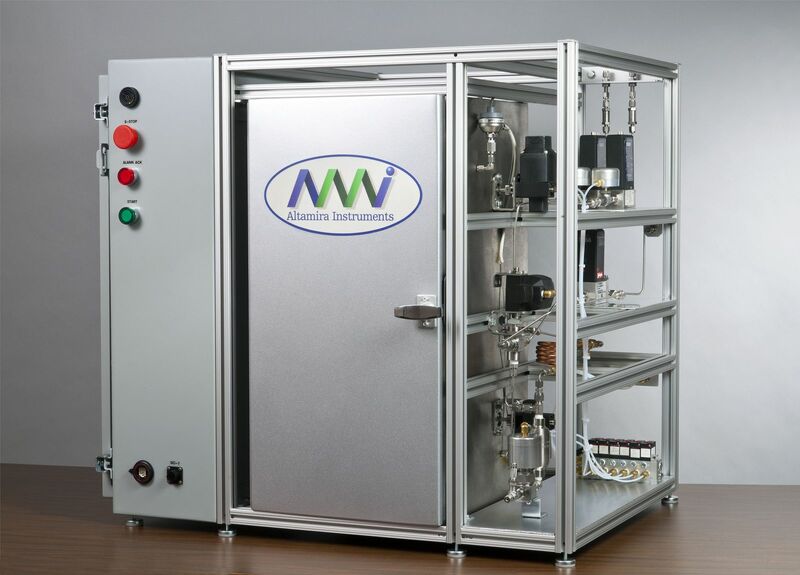 All the components required for either gas-phase or liquid-phase reaction studies are contained in a fully automated compact package. A variety of options makes the μBenchCAT suitable for a wide range of studies. The product effluent can be directed to an external detector, such as a gas chromatograph, via an optional heated or unheated sampling valve. Reactor Feed: Up to 6 gases and 2 liquids can be used in the standard configuration of the μBenchCAT. Each gas train incorporates a filter, electronic mass flow controller (MFC), check valve, and positive shut-off valve. The range and gas calibration of each MFC is specified by the customer. Liquids are delivered using high precision HPLC pumps. Condenser: A tube-in-tube condenser is located outside the oven at the outlet of the reactor. A thermocouple is used to monitor the coolant return. Gas/Liquid Separator: The gas/liquid separator is found downstream of the condenser. Two level switches (high and low) activate an automatic valve and serve to maintain level control. Pressure Control: Exit pressure is measured with a separate pressure transducer and the pressure is controlled using an automatic tapered needle valve. Product Sampling Valve: An optional product sampling valve can be used to route an effluent sample to an external analytical device. Heated Oven: Most process components are housed inside an isothermal oven operated at up to 200°C. The μBenchCAT is fully automated for ease of operation and reliability. It is designed so that it can be run unattended. The operator simply inputs process parameters as a series of steps and schedules a start time. Valve positions, flow rates, temperatures, pressures, and product sampling are controlled by the operating software. Data readback of the process are monitored at a rate specified by the user. The data are saved in a text-delimited format for easy transfer to other programs. 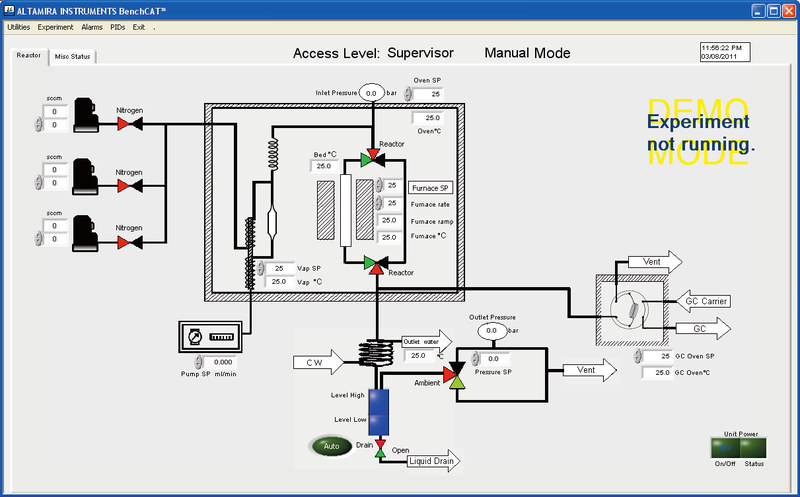 The control and data acquisition are performed using a LabVIEW application software specifically written for the μBenchCAT. Complete experiments can be written in minutes and saved for future use.